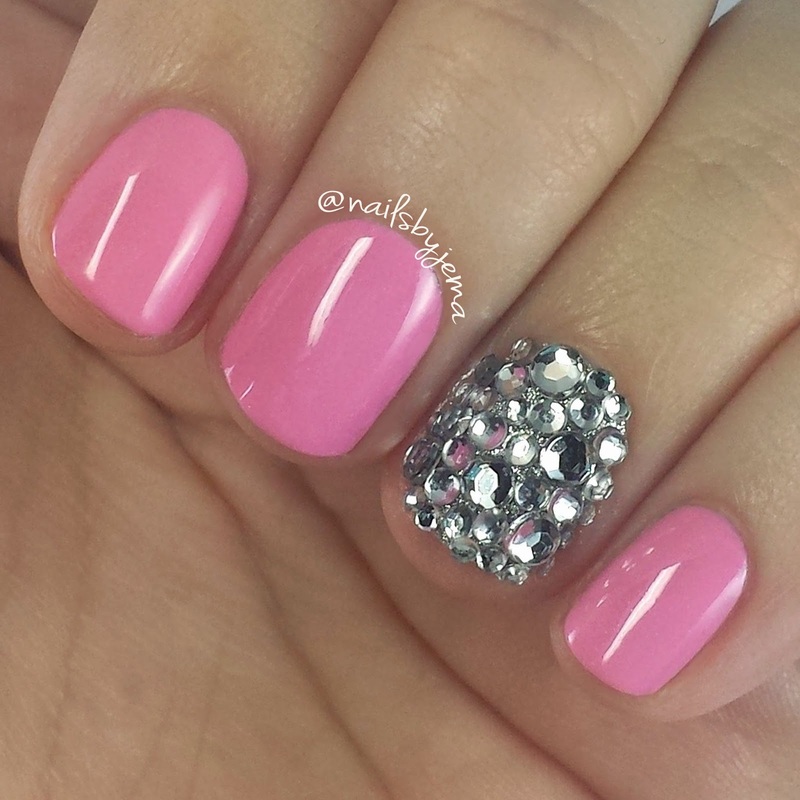 N A I L S B Y J E M A: Nubbin Nails Catch Up! I have a few manis to catch you all up on that I have posted on Instagram in the last week but haven't blogged about yet. The first is a stained glass/mosaic mani that I just sort of winged as I went. 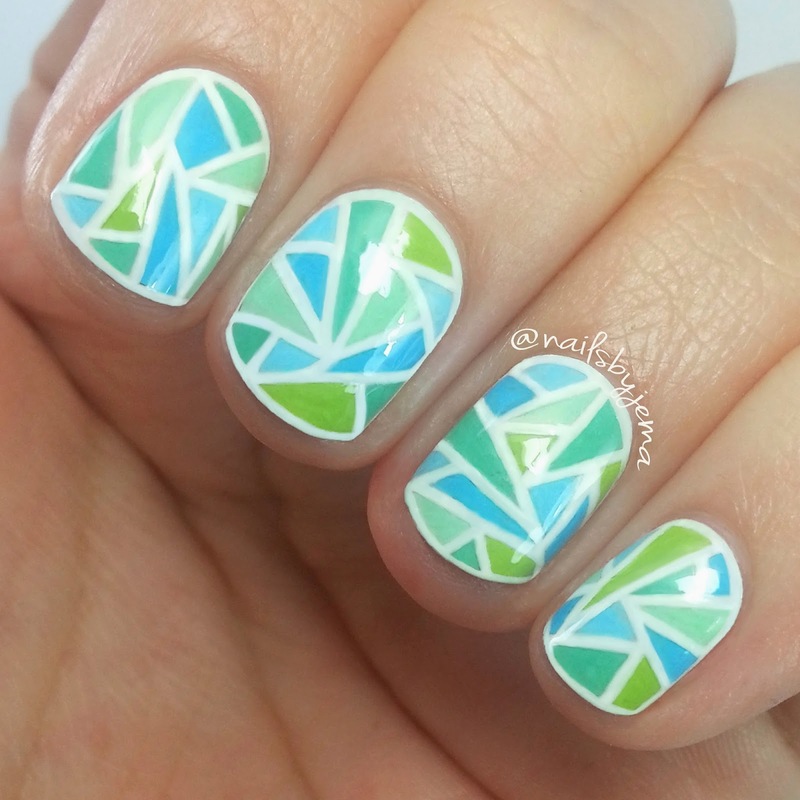 I drew the lines on with a white gel pen (I use the brand Uniball Signo) and then used various teals and greens to fill in random triangles. I went back over the white lines to clean them up and topped it with a couple of coats of top coat to smooth it out. I used Picture Polish 'Tiffany' and 'Jade', China Glaze 'Bahamian Escape' and Ulta3 'Lagoon'. The next nails were inspired by the amazing @wondrouslypolished who has been a total nail inspo for me with my nubbins. I took so many screencaps and filled in blank nail templates with ideas from her page!! Hers are so much better but I just couldn't be bothered with a gradient tonight, so I went simple. Go check her page out if you aren't already following because she is amaze. These were done with 'Jade' & 'Tiffany' by Picture Polish. I love my mints and teals at the moment. These are some nice and simple nails. As much as I love my nail art sometimes simple is just right. I used OPI 'Chic From Ears To Tail' and OPI 'It's Frosty Outside' and covered it in 5 different sizes of flat back Swarovski that I got from Born Pretty Store :) to keep the stones on, I used a coat of clear polish (I didn't do that for the photo as it tends to create bubbles.. boo polish bubbles!! I thought they were cute but they were very popular on Instagram which definitely proves the 'less is more' theory. Nautical nubbins! I received a huge bunch of charms this week that I ordered from Born Pretty Store and had to do something with the anchor I received right away. The chevrons are done with Small Nail Vinyls (now available to us Aussies through @picturepolish) and Essie 'Hip Anema' & 'Butler Please' over a base of OPI 'Alpine Snow'. The studs are from eBay. 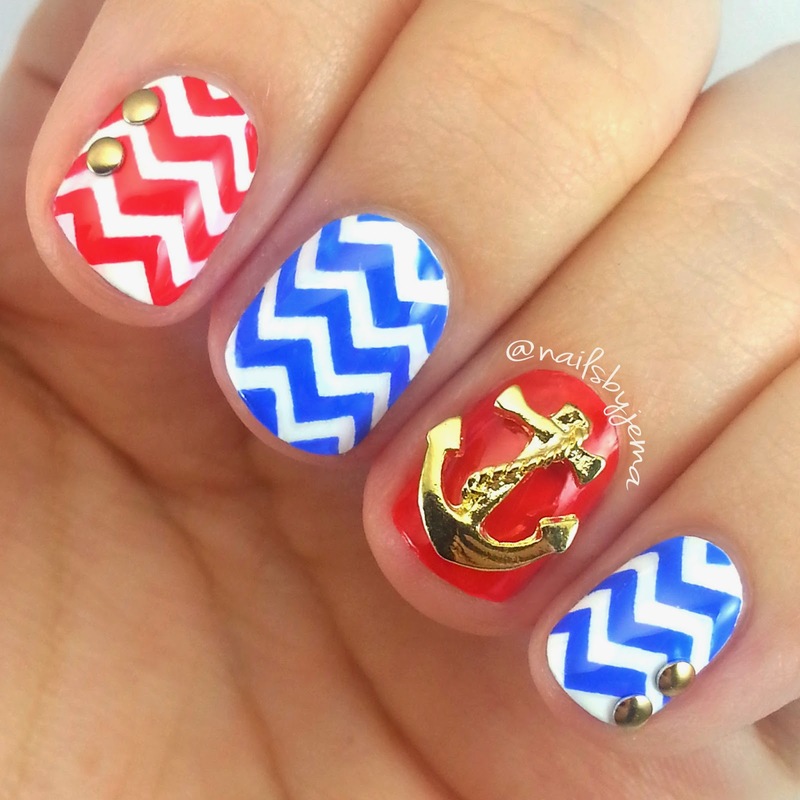 Definitely different to my other nautical nails but I love them. They're a lot more bold than my last ones. So that's my nubbin nails catch up post. I'm slowly getting over being MissJenFabulous'd (UPDATE: she denied ever seeing my nails before she did hers. Coincidence? Probably not.) and trying to just move on with more badass designs that she will want to copy!! Let me know which is your favorite and leave any requests in the comments.